The 2016 statute passed by the Tennessee General Assembly aimed to help local governments recover their costs for the work involved in responding to public records requests. The Tennessee General Assembly is seen in this file photo. The Tennessee Public Records Act is adamant that public records should be available. But that doesn't mean government entities will make them affordable. 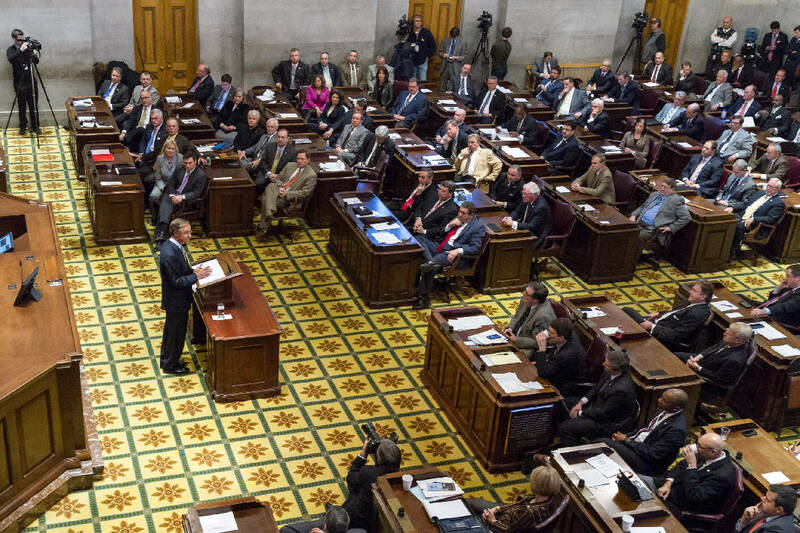 A statewide examination of 259 local government public records policies by the Tennessee Coalition for Open Government found that while almost all stated the government entity will charge for copies of public records, fewer offered the possibility of fee waivers. › 67 percent of cities and 58 percent of counties had policies allowing waivers if fees were under a certain amount. Those amounts ranged from 15 cents to $50, with a median of $5. › Only 4 percent of school districts had policies allowing waivers. › 59 percent of cities and 41 percent of counties give records custodians discretion to waive fees. › 3 percent of school districts give records custodians discretion to waive fees. › Within counties, individual constitutional offices may set their own fee policies. The state's Office of Open Records Counsel advises government entities that if they choose to charge fees for copies of public records, they should consider waivers in certain circumstances. Its model policy includes optional language for waivers, including a waiver for records determined to be for the "public good." However, the majority of government entities surveyed in the audit did not opt in. Only 33 percent allowed custodians discretion to waive fees for records when they are considered in the public interest or "for the public good." Slightly more, 41 percent, opted into language to waive fees if costs fells under a certain dollar amount. TCOG, a nonprofit organization that advocates for open government, conducted the audit October 2017 to March 2018 after the Tennessee General Assembly passed a law in 2016 for government entities to adopt written public records policies. TCOG sought 306 policies of counties, cities and school districts in all 95 counties. It was able to obtain 259 policies, and analyzed them on several factors, including their fee waiver policies. School districts were the least likely to include a fee waiver provision, with 3 percent of school districts audited allowing research and copying fees to be waived when records were found to be in the public interest and 4 percent when fees fell below a certain dollar amount, the audit found. Among cities examined, 59 percent allowed fees waived when records were determined for the "public good" and 67 percent allowed fee waivers by amount. Among counties, the figures were 41 percent and 58 percent, respectively. The cost, Fisher said, "also impacts journalists' ability to get and share information from public records with the public. If your local journalist can't get records because of fees and doesn't do a story, the public suffers." The audit found no pattern in the fee waivers by size of government entity. For instance, Nashville- Davidson County leaves it to department heads to waive fees "if the requesting party is indigent or if the administrative cost of collecting the payment is greater than the cost of providing the copies." Shelby County government waives fees under $10 and allows waivers above that at the discretion of the public records request coordinator. Hamilton and Knox counties don't mention fee waivers in their policies for general government, though Dana Beltramo in the Hamilton County Attorney's Office said waiver requests are considered on a case-by-case basis by individual department heads. Sevier County doesn't charge fees for records costing under $50, while Williamson County, the wealthiest county in Tennessee, will only automatically waive fees less than $1. Bradley County's policy also leaves out fee waivers. "I remember a comment when we adopted the policy that they didn't want to have to decide who should make the decision and what it would be based on," said Bradley County Attorney Crystal Freiberg, the public records custodian. However, individual county constitutional offices, such as court clerks, the sheriff's office and others, can and do set their own policies. Auditors found Clarksville doesn't charge for fewer than 50 copies and waives hourly research fees under $7.50. The city of Lexington, in Henderson County, had an unusual waiver policy in which it waives fees under $10, but only for elected or appointed officials. City Recorder Sue Wood said that's so local officials who need copies for, say, a planning commission meeting, can get them. "They didn't feel like every time they're in here they [should have] had to hand us 15 cents if it was something they needed for the meeting," Wood said. She said the city gets "very few" records requests and usually waives costs for fewer than five copies or if the documents are "routinely released and readily accessible." "Most of the time we don't have to charge," Woods said. The low number of fee waivers in school district policies may be because waivers aren't mentioned in policy guidelines the Tennessee School Boards Association handed out to school districts. Randall Bennett, deputy executive director and general counsel for the association, said waivers were noted as "optional." "When we craft policies we're very closely following the law and not necessarily including optional language unless we're requested to," Bennett said. He doesn't remember any school district asking for wording on the topic as it developed its policies. An audit by the Tennessee Coalition for Open Government found that some agencies had adopted rules that were so rigid that they threatened to slow down or thwart the process of getting records. A copy of TCOG’s audit can be found at tcog.info/public- records- policy-audit. "A lot of them feel like they're short-staffed and don't have the time to spend" crafting fee waivers, he added. "Plus, being a local government entity that's wholly dependent on another government entity to raise taxes, they don't have any alternative but begging and pleading. School districts are very concerned about making sure they're as frugal as possible," Bennett said. Fisher said she hears about large fees, especially from journalists who have to decide whether pursuing a story is worth the expense of getting copies of government records. A records request could involve a $15-an-hour clerk opening a file and copying a few pages. Or it could be someone earning $45 an hour and taking a week to get the job done. Nate Morabito, community watchdog reporter with WJHL, the CBS affiliate in Johnson City, Tennessee, said local governments more than once have tried to chase him off a story using exorbitant costs for records. He said the Kingsport Housing and Redevelopment Authority cited a $5,000 charge plus clearance from the U.S. Department of Housing and Urban Development when he asked for travel records. The agency wanted $541 just to allow him to inspect the records, Morabito said, even though the law doesn't allow charges for inspections. He stood his ground and the authority eventually turned over some records for free, he said. But most local governments are easy to work with and generous with fee waivers, Morabito said. Mealand Ragland- Hudgins, regional content coach with the USA Today Network-Tennessee, said the Daily News Journal in Murfreesboro was given a $700 quote for records related to a February police raid. The raiders targeted 23 cigarette shops that allegedly sold sweets containing an illegal hemp derivative. Charges against more than two dozen people were later dropped. The Daily News Journal asked for files related to internal briefings about the operation and for records on locations of items such as guns, cash and other material seized in the raids. Ragland-Hudgins said the records custodian didn't break down the estimate into research and copy charges. She said the paper got some of the information from another source and dropped its request. The Times Free Press fought over records costs last year with the Hamilton County Department of Education and the school board. Initially, the newspaper sought copies of five years' worth of complaints against bus drivers after a fatal crash that killed six elementary school children and injured dozens. The school system said that would cost $1,903. When the newspaper restricted its request to a single year of complaints, the school system estimate increased to $2,525. That included 45 hours of work from a person earning $45 an hour. The school system didn't say why a lower-paid employee couldn't do the job. Later that year, the Hamilton County Board of Education charged $176 to pull emails from the school board chairman about the superintendent search. In two emails the board chairman asked fellow board members not to share the contents of the email. The board claimed it took an employee making $34 an hour six hours to put together three email threads comprising 12 printed pages. "Charging exorbitant prices for information deters the public from asking for records, and a public official instructing other elected officials to keep public documents secret does not engender public trust."